To get to the Photos feature, we click on the “Show more” button to reveal the additional options. Our selection is just on the bottom of the list. Clicking on the “Photos” tab expands it to offer you two options for uploading your photo. … or click on “Choose file” and select it from a folder on your device. You can add up to 4 photos for each expense. The entry can now be saved and the photos will be stored next to your income or expense. … and click on it to bring up a detailed view. You can also edit the entry at any time by adding more photos or removing them altogether. Besided the receipts you can, for example, also attach photos of invoices and payslips next to your records of incomes. Add pictures of documents such as warranties of products you bought, invoices for tax review purposes, and photos of actual products and services you had just documented. Toshl monster can’t keep an eye on his expenses too well, but he’s definitely hooked on recording them all. With pictures! Certain things tend to repeat themselves. Some are pleasant, like spring or holidays. Others, for instance utility bills and car payments, are more of a necessary evil. Repeating entries are appropriate for use on financial accounts you otherwise track manually. Accounts that are connected to your bank, will add the entries automatically as they come in, so such repeating settings are not necessary there. After adding the basic expense information, click “Show more” under the “Save” button to display the additional options. The option to automatically repeat the entries is marked with an icon featuring the letter R in an arrowed circle. Click on the Repeat option and select a suitable interval from the menu. The “Custom repeat” option allows you to set a repeat with an uncommon interval. For instance, you could use it to record your expense that would be paid in 10 instalments (partial payments) every other week. In that case you would set the custom repeat to 2 weeks, and end repeating after 10 times. The repeats can go on forever until you stop them, stop after a certain date, or stop after a set number of repetitions. Select an option from the menu. Selecting the repeating to stop after a certain date brings up a calendar. … and clicking on the year label to display a year selection. 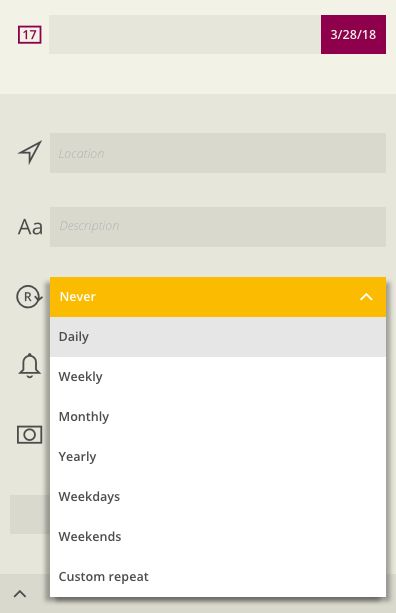 Date format can be adjusted in Settings, under the General tab. Check the Regional Settings tutorial for more information. For a set number of repetitions simply enter a one or two digit number. The date of the final repeat will be displayed on the screen. Also, your first expense is included in the repeat count. The weekly, monthly and yearly repeats, as well as the custom repeats (except custom daily repeats) will automatically set two reminders to notify you of an upcoming expense. The first reminder is set on a day before the expense, and a second one on the day the expense is due. You can modify the reminders according to your needs, or cancel them altogether. Entries that repeat automatically are marked with an “R” icon on your list of expenses. The set interval and a possible alert for the payment are included in their details. You are able to edit, duplicate or delete such expenses in the same way as all other entries. However, you do have to specify if you wish to apply changes to only the expense you are editing, to all the repetitions of this expense, or just the expenses that are planned for the future. The date can be edited only for an individual expense inside the repeat frame, but the repeating for the expense will continue the way it was set initially. edit the repeating expense by adjusting the date for “Stop repeating after”, and apply changes to “Expenses from now on”. When modifying or deleting the entries with repeats, make sure not to delete all the repetitions of an expense, if you wish to keep the past entries in your record of expenses. The most clear-cut example of a repeating income is the monthly salary. Let’s record a regular income of 1400 €, in a category “Salary”, for the financial account “General”. The event will be repeated monthly on the 15th, with a reminder on the day it’s due. Another good example for the use of repeats are the subscription services. Let’s check the recurring expenses for a media streaming subscription for 7.99 € on the 12th each month, file hosting for 9.99 € on the 10th, and, most importantly, a monthly delivery of socks for 12.02 € on the 21st. These amonts will be billed on the credit card (be careful when selecting the appropriate financial account). 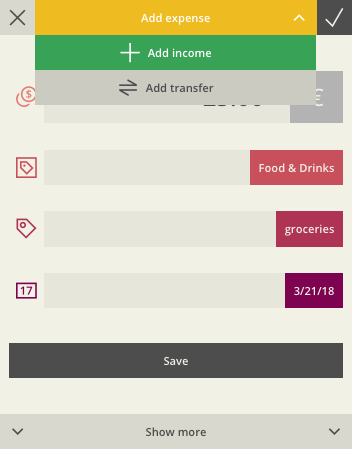 Open up a new transfer tab (click on the “All accounts” tab in the upper right corner and select “Add transfer” option), enter the amount as well as the “Source” and “Destination” accounts – in our case that’s “General” and “Savings”. Proceed with the date, an optional description, the repeat setting, and a reminder. Let’s say that you bought a 750 € custom paint job for your car, as one of those impulse purchases. No reason to worry, here’s how you can quickly split your expense into, for instance, 3 instalments with a custom repeat every 3 weeks, for a total of 3 repeats for 250 € each. After you have entered the amount for your expense and selected a category, click the “Show more” button on the bottom of the expense window. Location option is the first optional feature in the extended view. Select the newly shown tab to receive a list of suggestions on your current location. This list depends on the location information that your web browser can obtain at the time. By default you will see the venues in your vicinity. If the location you’re searching for isn’t on the list, or if you are recording a past expense, enter it manually. Let’s say that, for example, you bought a pair of running shoes. You can enter the store’s name and the app will provide a list of options. Another option is to enter the name of the venue, add a comma (,), and type in the town or city where the expense took place. Check this guide on the use of a comma with locations. The Locations tab in the main menu displays a map with all the recorded expenses with stored locations. Clicking on a mark on the map brings up a bubble with the amount that was spent there. From here you can review the expenses in detail just like in the main Expenses menu. Select an expense from the list to see additional information, as well as the exact location on a mini map. If you wish to learn more about using locations with your incomes and expenses in the Toshl app, check our Location, Location, Location! guide.